(Last Updated : 16.02.19). Download UPSESSB TGT PGT Admit Card 2019 for TGT PGT Exam 2016. Uttar Pradesh Secondary Education Service Selection Board (UPSESSB) released Admit Card for TGT Exam 2016 & PGT Exam 2016 to be held in February-March 2019. The written examination is scheduled to be held on 01 & 02 February 2019 and 08 & 09 March 2019 in two shifts - shift-1 (morning) & shift-2 (evening) for the post of TGT (Advt. No. 01/2016) & PGT (Advt. No. 02/2016). 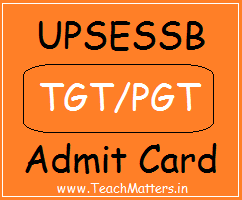 Download TGT/PGT Admit Card, Exam Time Table 2019 at the official website of UPSESSB i.e. www.upsessb.org. Candidates can download their admit card for TGT/PGT Exam 2019 through the official website. Candidates can search their admit card after submission of their Control Number or Date of Birth or Name etc. Here are steps for how to download admit card. Enter the details in any one Search Option out of 4 Search Options. Search admit card and download it. Take print out and read instructions carefully. Candidates who are going to appear in screening test of TGT & PGT Exam 2019 can download their admit card as per the schedule to be available soon on the official website. UP TGT Exam 2019 is scheduled to be held in the 2nd week of March, 2019. Download TGT Admit Card 2019 for TGT Exam 2016 at the below link (as per schedule). The written test for the post of PGT (02/16) is scheduled to be held in February, 2019 as per the schedule. Download PGT Admit Card 2019 for PGT Exam 2016 at the below link (as per schedule).